Atthreya Suprapa muni established a Yaga sala. During inspection of the yagasala with Rit-Wiks , he found a very bright Tholai (Tharasu Scale) and a vil(Dhanus - bow). With his touch they turned into a man and woman. The place is called Tholaivillimangalam as Tholai and vil obtained mukti from the curse of Kubera. Two temples together make one Divya desa and hence called Erattai (twin) Tirupati and are one of the Azhwar nava Tirupati.Swami Manavala Mamunigal has done Mangalasasanam for this sthalam. Two miles east of Azhwar Thirunagari. First temple is found along the banks of River Tamirabarani. 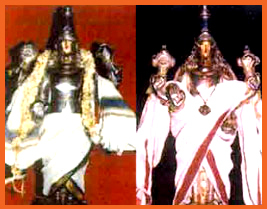 The Moolavar of first sthalam is named "Sri Srinivasan". Also named as "Devapiran". He is giving his seva in Nindra thirukkolam facing his thirumugam (face) facing in East direction. Two pirattiyaars are found on either side of him. Second sthalam is found along the Tamirabarani river. This sthala Moolavar is "Aravindha Lochanar". Also named as "Senthamarai Kannan". He is giving his seva in Veetrirundha thirukkolam facing east direction. This place is about 3 kms from Srivaikuntam. The temples are about 150mts from apart and the second temple is on the banks of the Tamarabharani river. One can reach Thollaivillimangalam from Azhwar Thirunagari by travelling 3 kms along the Thamarabharani River.Alternatively from Tirukulandhai one can go to Mangalakuruchi which is about 2 kms and from there travel along the stream for 3 kms to reach thollaivillimangalam.This is also known as Irattai Thiupathi There are no facilities available here.